It was when Joie, Arfi & Andrea mentioned about their love for Indian cooking in my blog, I realized that all my posts are someway incomplete for non-Indian cooks. Apologies for that!!! From now on, I will try my best to post easy-to-understand and follow recipes. I will definitely suggest the replacement ingredients for the typically Indian ones. Thanks for ringing a bell in my head! (smiles). From Indians to Chinese to Italians to Spanish, everyone eats rice in one form or the other. But the rice variety varies from region to region. Rice is an international staple food but I guess we cannt make Indian Briyani with Jasmine rice or cooking a Paella with hand pound Indian rice would be a disaster. So each regional rice variety has to be used to get the perfect taste. 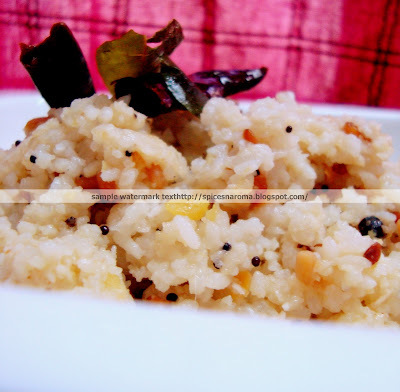 My post for today is not any ordinary rice dish. Its simple yet complex in taste. Its called “Arisi upma” . In Tamil, Arisi means rice and upma (I am unable to give you a direct translation) a dish with rice/wheat/vermicilli seasoned with home grown spices. (thats the closest I could get to) 😉 .From the information I gathered from my aunts and mom, I think this dish is originally from Tamil Nadu (TN) and this is a very common breakfast dish in the interiors parts of TN. It is made from simple rice and even more simpler spices. Cooking a vegetarian food is lot more straightforward and less time consuming.I truly agree to this notion with regard to this dish. This gorgeous dish provides a lot of pleasure in every munch – a perfect comfort food!!! The emanating aroma of dry red chillies and curry leaves wonderfully synchronizes with perfectly cooked fluffy rice. I love this dish to bits. An amazing feel is created till the last snow-white flavoured rice grain makes its way to your stomach. Clean the rice with running cold water and spread them over the kitchen towels to dry. Once partially dried, pound them into course powdered form in a mixie. (Don’t grind them into a paste or fine powder. It should have a broken rice look). 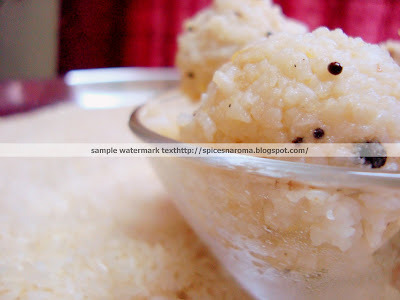 Grind the toor dhal and black pepper balls into coarse powder like form in mixie or mortar/pestle. Heat a heavy bottom pan with oil. Temper the dry red chillies, mustard,urad dhal and curry leaves. Cook for about a min or 2. Add 3 cups of water and bring them to boil. 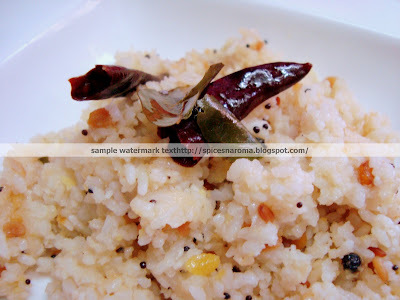 Serve hot with milagai podi/sambhar/chutney. Note: Generally my mother rolls them into small balls and serves it. 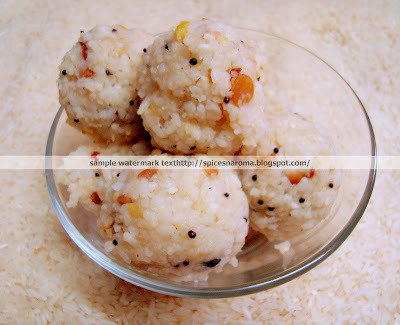 This is my entry for Srivalli’s Rice mela. Oh how delicious that looks!!!! I love rice, absolutely love it. Thanks for the recipe. oh i’m familiar with this kind of this. surely is yummy!!! Looks lovely, and I think I could definitely follow that recipe. 🙂 Thanks for thinking of me. hey Vij, this is looking very tempting n mouthwatering :). lovely pic too. Arisi upma always holds a special place… 🙂 Looks great. that looks so mouth-watering and yummy! A delicious comfort food. So pretty and delicate. Just lovely. That looks good..never made with this..thanks!